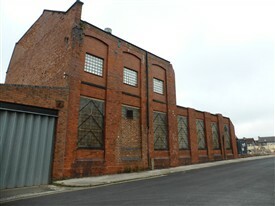 Huthwaite - former CWS hosiery factory. It is thought that the site was chosen because the Unwin Land Society were prepared to give an acre of land free to facilitate a new industry in Huthwaite. Negotiations began in 1906. Additional land was acquired so the building of the factory could go ahead. The architect of the 1907 building was Mr. F.E. Harris of Manchester and the contractor Mr. J. Dickinson of Derby. Machinery was moved from a previous factory at Cranbourne Street, Leicester, which was run as an independent concern by the Leicester Co-operative Hosiery Society, a group of co-operators established in order to supply the distributing societies in the country. As demand for products increased, the "wholesale" side decided to manufacture hosiery, and bought the Leicester building. 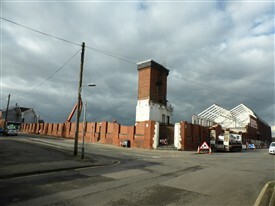 The Huthwaite factory being built led to the closure of the Leicester one, but employees were offered positions in Huthwaite. This large Huthwaite building occupied a rectangular site extending about 475ft north-south along North Street and 350ft east-west along High Street in Huthwaite. The width being 50ft. When first built in 1907, it extended only 230ft along North Street, At that time there were two floors. On the first floor of the main building five departments housed machinery for the manufacturing of hosiery. On the ground floor was a yarn store, finished stock rooms, warehouse, press and trimming rooms. Another block was erected at the rear of the factory, 100ft in length by 45 ft. containing the power house, and milling and dyeing departments. It also had the fitters, shop and store. Next to the engine house was the boiler house and economiser, this led to a 95ft chimney. The factory manager was Mr E. S. Smith. At the end of 1907 there were 40 people working there. In March 1919 it was closed due to lack of fuel because of a miners dispute, but in the same year it also extended further down North Street. Various buildings were added later, the most recent being the block along the north side of the site. In 1940, the British Royal Navy took over this 4-storey block to be the headquarters of their medical supply department for most of World War II. It was sometimes referred to as the Belmont Clothing Factory, "Belmont" was a clothing brand name, rather than the name of the building. When first opened, it was expected to employ 400 people, but by 1969 employed in the region of 1,500. It was certainly the major employer of female labour in Huthwaite (New Hucknall Colliery being the major employer of males). There was a social side to the factory as well, with its football, bowls, tennis and cricket teams. It also had it's own fire brigade at one time. The CWS finished in 1969, with redundancy notices given out. In 1969, The Mansfield Hosiery Company took over the CWS building, and started modernising the buildings. Decorating began and new machinery was installed to quicken up the processes. Machinists began work on 1st January 1970, employment having been offered to 93% of the original Huthwaite staff. Some members of staff staying put, and others transferring to sister company, Simpson, Wright and Lowe on Huthwaite Road. Tailoring for men and women was to be sold at Marks and Spencer Stores. In the early 1970’s The Clothing Factory became known as Meritina. 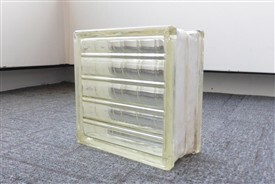 The printing works which moved from Mansfield, became Angloprint, printing the packaging which was to be used for wrapping the finished items. Ladies skirts were the first garments to be produced, and later men's trousers, with ladies jackets and even a few hot pants and ladies pants being produced. Still interested in the welfare of it's staff, It had a sports and social club which was also used as a kids club during the school holidays, and was known as the Mansfield Hosiery Mills Sports and Social Club on Mansfield Road. 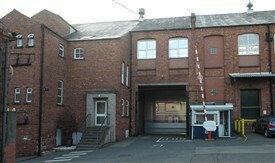 In the late 1970's the main factory building had four floors. Cutting floor at the top (Edna Patman), Trouser Floor (Rina Paloc), Skirts Floor (Joyce Wood) and packing at the bottom. (Malcolm Ballard), with Angloprint under Mike Tuska. All floors were interconnected by corridors and stairs. The main factory stairs were made of stone, The offices and boardroom were on the same floor as the trousers, but linked by a corridor. In the main office, everyone sat in uniform rows at desks concentrating on their specialised work. Separate offices around the sides of the main area were for managers and directors. The personnel office, and boardroom were off the reception area. Nina Mumford was personnel officer, later followed by Betty Kirk. Some of the designers for Meritina were E Brittle; J Lord; J Barnes; and S Smith. Training: Winnie Barnes; Head Mechanic: Colin Perkins; Head Electrician: Alan Wilkinson. Some management staff names: Dr Bruce; K. Tuska; R. Hextall; M. Hallows; I. Mcrae; R. Lumsden; P. Timbers; S. Spalding; R. Hollingsworth; R. Paloc; J. Wood; E. Patman; J. Shaw; J. McGuire; P. Dickenson; J. Aspinal; G. Harrison; G. Butterworth; B. Waldon; C. Starbuck. Access into the factory was by a series of steps, and the reception area always looked welcoming with its rather large plant in the corner, and fresh Christmas tree at the end of the year. 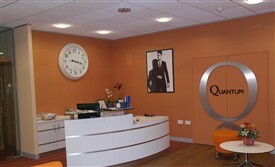 To the left was the reception area, with a full time receptionist. This always had to be manned it was part of the welcome. The switchboard housed a two line pabx switchboard, and at the side was a telex. The telex was frequently in use, spewing out lots of messages. It was a forerunner of e-mail I suppose! Directly opposite this was the medical room. It looked out over the entrance to the factory yard. The yard had a security box visible as soon as anyone came under the archway. Eric Roberts, Arthur, and Sam Holloway were some of the security men working there at the time. Occasionally, they would stop a member of the workforce for a bag search. Opposite the security box was the entrance to Anglo Print, and to the right was the entrance to the canteen. Caroline commanded the canteen staff, and they produced main meals as well as snacks, it was no mean feat considering the amount of staff on site. Two of the canteen staff were Olive and Hilda. The firm laid on buses for its employees. Rainworth Travel did some of the runs. The furthest it went was to Higham for supervisor Jean Barringer. If the company thought that they needed a certain person, they would move the earth to get them into the factory! Often they would send a member of staff with a car to pick them up. At night, the buses would line up next to the factory on High Street, waiting for the workers to come out, and in the mornings would be the same line up bringing them to the site. In March/April 1978, Meritina Two Steeples began operating at Common Road in Huthwaite, with many departments and personnel from the North Street factory transferred to the new building. The cutting floor, the technical room, and office staff were among those who moved from North Street. Elaine Moulton became Personnel Officer of the factory. For a new article to get to the production stage, designers such as Sally Smith would draw up a garment. This would be made up. If accepted, it would be decided on the best way to make the article, and the processes which would be involved. In August 1986, a fashion show was held at Sutton Centre School by Meritina of Common Road, which raised £2,200 for two charity appeals. The hospice appeal, and the scanner appeal, both of which were connected with Kings Mill Hospital. There was a branch of Meritina in Newark, and also Retford. Alongside them, English Rose at Somercotes, Mansfield Hosiery Mills at Mansfield, and Stevensons Dyers. In 1988 Meritina changed its name to C V Apparel Ltd., being part of Coats Viyella PLC Group. Some of the production of garments moved to Morocco in the 1980's. The "Coats" part being J.P. Coats the cotton manufacturer. Coats Viyella was once one of the UK’s leading textile businesses with retail (Jaeger), thread (Coats) and manufacturing (CV Clothing) businesses. In April 1998, 90 days notice of closure was announced for Coats Viyella. The workforce were told the company were also closing a counterpart operation at Nix's Hill Alfreton, and the counterpart knitting operation at Maltby, S. Yorks was at that time going through the closure process, as was a section of Simpson, Wright and Lowe, as part of the companies demerger plan. Simpson, Wright and Lowe lost 42 jobs. 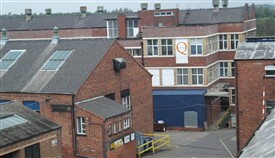 The building was later occupied by the Quantum Clothing Group. Quantum was created as a management buy-out from Coats Viyella in December 2000, (one of the shares belonging to Stevensons Dyers). It employed around 5000 people worldwide. All their UK operations including warehousing, design, development, commercial and finance operated from this site in Huthwaite, together with a small office in Ireland. In January 2009 the Quantum Clothing Group purchased the Marks and Spencer part of the lingerie business Essensual Lingerie Ltd. This was renamed Quantum Lingerie. At that time, the main part of the company was based in Harrogate, North Yorkshire later relocating to Edwalton in Nottinghamshire. In July 2012, the Quantum Clothing Group was acquired by Japanese conglomerate Itochu Corp. In April 2015, Ashfield District Council allowed "demolition of the existing warehousing and factory complex." In 2016, demolition began. This page was added by Marg Thorne on 05/12/2017.